Nozzles: Although durable, nozzles do wear over time. This wear will negatively affect the spray pattern and eventually lead to less uniform applications. The droplet spectrum will start to change as well, and with ever more stringent spray quality (droplet size) restrictions on labels, this is increasingly important. While it can't hurt to ask for a one-size-fits-all nozzle, know that the elves in the engineering department haven't quite gotten that design worked out yet. Instead, choose dedicated nozzle sets for different product, crop, and weather scenarios specific to your operation. Nozzle bodies or turrets: With multiple sets of nozzles at hand we are ready to tailor our application to whatever the label and mother nature throw our way. Productivity, however, depends on timely access to the right nozzle. Bodies with 5-nozzle turrets are standard on new sprayers for this reason and allow for changing tips (almost) as fast as the wind shifts. If you intend to use high flow rate nozzles for fertilizer applications, ensure that the body you choose is rated appropriately. Rate controller: If your rate controller is sluggish to respond to speed changes, over/under-application is occurring. A new rate controller can remedy this and even offer a shiny new touchscreen interface for a better user experience. While you're shopping, be sure to investigate the advantages of stepping up to a Pulse-Width-Modulation (PWM) retrofit system. By decoupling pressure and flow rate, these systems allow for more precise control of your droplet spectrum. Some variants allow flow control down to the individual nozzle level which enables features such as turn compensation (decreasing flow to nozzles inside the turn and increasing flow to nozzles outside the turn) to maximize application rate uniformity. 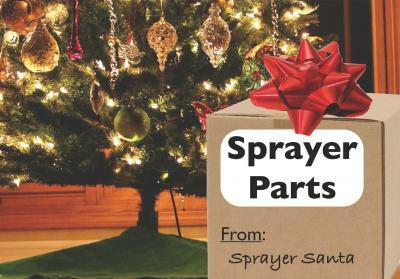 Even if you wake up December 25th to a stocking full of coal, you should still consider these sprayer upgrades. The ROI will not only be made in productivity, but in higher quality work and a better operator experience. A pesticide label may call for an applicator to use coveralls when either mixing or applying pesticides, but did you ever consider what kind of coveralls you should use? 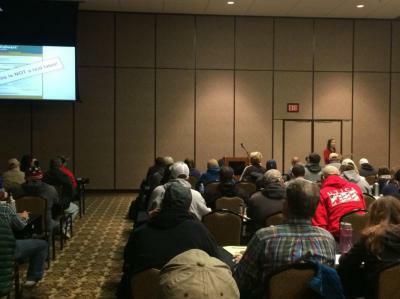 At our pesticide safety education training clinics, it is mentioned that coveralls may be required, and sometimes a label will specify whether it needs to be chemically resistant. Most of the time when we think of coveralls or perhaps see a picture of someone in coveralls it is in a chemically resistant suit. This may lead to wearing the wrong personal protective equipment when handling pesticides. There are several types of coveralls: one piece or two piece coveralls, as well as one or two piece chemical-resistant coveralls. It is important to know which one will be able to meet the demands of the label. Coveralls should be made of a woven fabric such as cotton, polyester, a cotton-synthetic blend, or a non-woven fabric. Woven fabric should be a tightly woven, sturdy material (such as denim) weighing 7-10 ounces per square yard. The design of coveralls also influences the amount of protection they offer. Well-designed coveralls have tightly constructed seams and snug, overlapping closures that do not gap or become unfastened readily. One-piece coveralls look like jump suits or flight suits. Two-piece coveralls look like surgeons' suits. Applicators need to fasten coveralls securely so the entire body is covered except for the feet, hands, neck, and head. You should not tuck a two-piece coverall in at the waist: the shirt should extend well below the waist and fit loosely around the hips. More body protection is a good idea when handling pesticides that are highly or moderately toxic when absorbed through the skin or that can irritate the skin. Unless the label directs otherwise, wear coveralls over clothing, preferably a long-sleeved shirt and long plants. The clothing under the coveralls should cover the body at least from the shoulders to the thighs. The pesticide labeling may specify a particular type of clothing to be worn under the coveralls. Several factors affect the amount of protection coveralls provide. The coveralls should fit loosely. Unless there is a layer of air between the coverall and the skin, any pesticide that gets through the coveralls will be in direct contact with the skin. Each layer of clothing worn under the coveralls adds a layer of protection. A few pesticide labels may require handlers to wear chemically resistant suits. This most often indicates that the pesticide is very hazardous and that extra precautions might be necessary. These suits may be one-piece coveralls or two-piece outfits consisting of a jacket worn over overalls or pants. Unfortunately, these suits can be uncomfortably warm to wear. Even in climate-controlled conditions, suits may still cause overheating. It is necessary to take precautions to avoid heat stress when wearing these suits. Be sure to outfit yourself with the necessary personal protective equipment and make sure it is the appropriate type. Pesticides come with a risk of exposure, and the label can identify the equipment needed to reduce that risk, but it is our responsibility to choose the correct type of material and equipment for the job. Many manufacturers also conduct pesticide ratings on their materials for breakthrough, permeation, and degradation. If you should have any questions about whether the material is appropriate for the intended use, the manufacturer should be your first call. Source: Personal Protective Equipment Guide: Coveralls, Gloves, and Other Skin Protection, EPA, 1993. Ohio, Indiana, and Illinois are heavily infested with weeds resistant to glyphosate (group 9), PPO inhibitors (group 14), and ALS inhibitors (group 2). This has greatly reduced the number of effective postemergence herbicides for controlling these weeds in Roundup Ready 2 (RR2) soybeans. Adoption of Roundup Ready 2 Xtend (glyphosate and dicamba resistant – RR2 Xtend) soybeans and use of dicamba-based herbicides is one option for managing resistant weed populations. Keep in mind that selection for dicamba resistance occurs each time dicamba is applied, and over reliance on this technology will lead to the development of dicamba-resistant weed populations. Concurrent with the development of dicamba-resistant soybean varieties, Bayer and BASF developed new formulations of dicamba herbicides for use in RR2 Xtend soybeans that are supposed to be lower in volatility compared with previous dicamba products. These products are Xtendimax (Bayer), FeXapan (same thing as Xtendimax, but sold by Corteva), and Engenia (BASF). The federal labels for these herbicides contain very detailed application instructions to reduce risk of off-target movement. However, in 2017 and 2018, there were thousands of cases of off-target movement affecting millions of acres throughout the soybean growing region of the US. As a result, we provide information here to help reduce risk of off-target movement of dicamba applied to RR2 Xtend varieties. The information provided here is not necessarily inclusive, or meant to replace a thorough knowledge of herbicide labels and other information provided by manufacturers. In late October 2018, the EPA approved revised labels for Xtendimax, FeXapan, and Engenia. All three products are restricted use pesticides, meaning an applicators license must be held in order to purchase and apply these products. It is no longer acceptable to simply operate under the supervision of someone with a license. The labels continue to require applicators to attend an annual dicamba or group 4 herbicide-specific training prior to using the products. In addition to becoming restricted use pesticides, these revised labels have more restrictions outlining how the products should be applied. The language regarding buffers and applications near sensitive crops has also been rewritten for clarification on what constitutes sensitive areas and crops, and how the products should be applied. As of early November 2018, there were only three dicamba-containing products approved for preplant, preemergence, or postemergence use in Roundup Ready Xtend soybeans. The approved products are Xtendimax, FeXapan, and Engenia. It is a violation of federal and state law to use anything but approved formulations of dicamba on Roundup Ready Xtend soybeans. Other dicamba products can be used at least 14 days preplant, if the appropriate waiting interval is followed per the label for non-Xtend soybeans. The labels state that a buffer is required if wind is blowing towards a sensitive area, and that dicamba should not be applied at all if the wind is blowing toward a sensitive crop. In 2017 and 2018, it appeared that many applicators did not follow this restriction, perhaps because a specific distance to the sensitive crop was not specified and sensitive areas were not well defined. Realistically, if the sensitive crop is within a 0.5 mile or less of the target field, common sense would suggest it might not be a good idea to apply to that field. If wind is blowing towards extremely sensitive vegetation, such as non-Xtend soybean varieties, we recommend not to spray until the wind is blowing away from the sensitive crop on the day of application, and also for the next 2 to 3 days after application. The labels allow spray applications when wind speeds are between 3 and 10 mph, and these wind speeds are to be measured at the boom height. In 2017 and 2018, a key aspect overlooked by many was the speed of wind gusts, and many applicators may have focused more attention on average wind speed rather than wind gust speed. As a result, many spray applications were made during days when average wind speeds were less than 10 miles an hour, but in many instances wind gusts were in excess of 10 miles an hour. We strongly recommend not applying on days when wind gusts exceed 10 miles an hour even if sustained wind speeds are less than 10 miles an hour. It is not always easy to find a window with these lower wind speeds. The reality is that some years can be challenging to make applications of dicamba products that have very strict label precautions with regard to wind. The labels now allow applications to be made only between 1 hour after sunrise and 2 hours before sunset. This is to restrict applications to when temperature inversions are less likely to occur. If the time of day restriction was in place in 2018, there would have been substantially fewer hours in June where applications could be made. Accounting for conditions that allowed equipment traffic, West Central Indiana would have had only 39 hours in June with wind speeds between 3 and 10 mph between the legal application hours. During a temperature inversion, very small spray droplets remain suspended in the air and do not settle on plants or the soil surface. These droplets will move when wind speed increases later in the day. We strongly recommend that you use an app like Spray Smart or something similar to determine whether or not a temperature inversion exists. If there is a temperature inversion, do not spray until the inversion has lifted. Another frequent violation of the label in 2018 was failure to implement buffers near sensitive areas. Many applicators took the approach that if the wind was blowing away from the sensitive crop, dicamba could be applied right up next to the sensitive crop. These buffers have become more restrictive heading into 2019. In addition to the downwind buffer to sensitive areas, there is now a 57 foot in-field buffer around the perimeter of fields if an endangered specie is present in your county. It is the applicator's responsibility to check the appropriate sources for the presence of endangered species. University research has demonstrated that even the new formulations of dicamba can volatilize and move on dust particles for up to three days following application. Wind directions can change on day two or day three and move volatilized dicamba or dicamba dust to sensitive vegetation. So the establishment of buffers is extremely important if you are near a sensitive area. Consult the websites for the respective herbicides to find the list of approved nozzles and spray pressures to apply the approved dicamba products to Xtend soybeans. The list of approved spray additives changes frequently, so it is important to regularly check the websites. All approved dicamba products require the use of a drift control agent from the list of approved drift control agents on their respective website. The addition of any other product, including foliar fertilizers, insecticides, herbicides, or fungicides, that is not listed on the website for the respective herbicide constitutes a label violation. Do not add ammonium sulfate or anything containing ammonium sulfate as this produces more of the volatile form of dicamba. There are approved non-ammonium sulfate based water conditioners to reduce hard water antagonizing glyphosate that is tank-mixed with an approved dicamba formulation. Finally, use of a pH buffer may be necessary to keep spray solution pH above 5. A pH below 5 can increase volatility of dicamba products. The following are a number of additional suggestions to implement if you are concerned about offsite movement. Keep in mind that one can do everything "per the label" but still have offsite movement. This happens because: 1) even these new dicamba formulations have the capability of volatilizing and moving on dust particles; 2) fine spray particles can remain suspended in inversions; and 3) and dicamba can move with runoff water after heavy rainfall events. 1) Do not spray when the forecast indicates wind gusts will exceed 10 mile per hour. It is impossible to predict when a gust of this magnitude will happen nor how long it will last. Gusts that reach 30 mph can move spray particles and vapor for great distances. 2) Reduce boom heights to the 24-inches above the target height limit specified on the label. Simply reducing the boom height from 48 to 24 inches has been shown to reduce the distance traveled by drift particles by 50%. One of the most effective ways to safely lower the boom height without running the boom into the ground is to reduce sprayer travel speed. Also remember that any travel speed over 15 mph is off-label. The labels also now recommend that travel speeds be reduced to 5 mph when making applications on the field edges. 3) Avoid application when temperature exceeds 80 degrees. Assuming that these dicamba products have some potential for volatility, the risk of this occurring increases with temperature. 4) Consider applying dicamba only preplant, preemergence, or very early postemergence. Over 90% of the offsite movement complaints resulted from postemergence applications. Our assumption is that applications earlier in spring will have less likelihood to cause problems even where dicamba moves, due to the absence in many cases of any developed vegetation to injure. Temperatures are also likely to be lower when applied preplant/preemergence versus postemergence, possibly reducing the risk of movement via volatility. 5) Have conversations with neighbors to know what crops and technologies are being planted around Xtend soybean fields. Many offsite movement cases in 2018 occurred where neighbors planted Xtend and non-Xtend soybean adjacent to each other. Knowing what sensitive crops are in the vicinity of your Xtend fields will enable better decision-making about use of dicamba in a given field. Authors: Bill Johnson, Joe Ikley, Aaron Hager, University of Illinois, and Mark Loux, The Ohio State University. Also published in the Pest & Crop Newsletter, Purdue Extension. Under the new dicamba labels, anyone applying dicamba over the top of soybeans must be a certified applicator. In Illinois, this means that anyone who intends to apply dicamba to soybeans in 2019 must have a commercial applicator or private applicator license. Commercial operators and farm employees working under the supervision of certified applicators can no longer apply dicamba unless they become certified applicators. Commercial operators are licensed by taking and passing the general standards exam. To be a certified applicator who can apply dicamba to soybeans commercially, both the general standards and field crops applicator exams must be taken and passed. Private farm employees can become certified applicators by taking and passing the private applicator exam. With these new rules in place, some have expressed concern about whether there will be enough training opportunities for those who need to take field crops applicator training. To meet the demands for these trainings, the University of Illinois Pesticide Safety Education Program team has opened four additional field crops only training dates. All dates for commercial clinics that offer field crops training, all private applicator clinic dates and registration information are listed below for your convenience. To register by phone, please call (800) 644-2123 or (217) 244-2123. Please contact Illinois Department of Agriculture online (www.agr.state.il.us) or by phone (800) 641-3934 or (217) 785-2427. Jan. 18 – Utica Celebrations 150 Ltd.
Dec. 4 – Utica Celebrations 150 Ltd.
For the full list of training clinic dates, please visit the University of Illinois Extension Pesticide Safety Education Program website.